CIA-director nominee Gina Haspel speaks during her confirmation hearing before the Senate Select Committee on Intelligence on May 9, 2018, in Washington, D.C.
On Wednesday, Gina Haspel, President Donald Trump’s nomination to head the CIA, made her first appearance before a Senate committee hearing, and she sounded like and looked the part of a sweet, cookie-baking grandmother who wants nothing more than to “Make America great again.” But make no mistake about it; during her 33 years with the CIA, in the Directorate of Operations unit, Haspel oversaw some top secret spying missions around the globe and the horrendous torture of prisoners. During the George W. Bush administration, Haspel oversaw a secret “black site” prison in Thailand in which prisoners were subjected to torturous interrogation methods including waterboarding, sleep deprivation and “walling,” where prisoners were repeatedly thrown into walls. 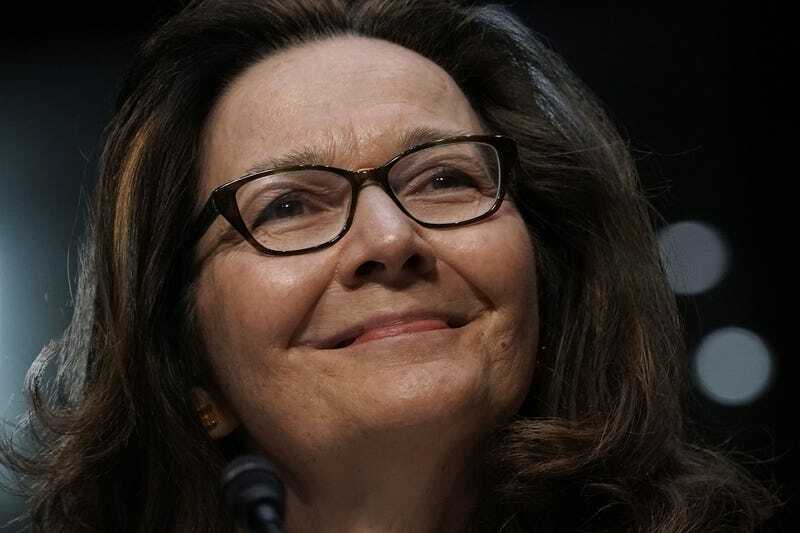 If that wasn’t bad enough, internal CIA documents obtained by BuzzFeed showed that Haspel was involved in the destruction of nearly 100 videotapes reportedly showing the abuse of two prisoners, Abu Zubaydah and Abd al-Rahim al-Nashiri. Haspel contends that the destroyed videotapes were only of one prisoner. For the rendition flight to Libya, I was taped to a stretcher again. The tape caught the corner of my eye. It stayed that way, my eye taped open, tears streaming down my face, for more than 14 hours. Shortly after she was tortured, she gave birth to her baby. Haspel is a thug. Congress knows it. The president knows it and likes it. Trump not only has been adamant that waterboarding works but also believes that it’s necessary. Trump not only believes that torture works but also wants to change the law to allow for it again. Which all leads to Haspel’s Senate confirmation hearing and her utter defiance and refusal to answer direct questions about her feelings on torture. When Sen. Kamala Harris (D-Calif.) asked Haspel, “Do you believe that the previous interrogation techniques were immoral?” Haspel refused to answer yes or no. Watch the full exchange below, since it’s awesome, and not because Haspel dances more than Donald Glover in “This Is America,” but because Harris holds Haspel’s feet to the flame and tries her best to get her to answer whether or not she believes that torture is immoral. What Haspel did say, although it wasn’t an answer to Harris’ question, was actually more telling. Haspel basically explained that she was and is a good soldier who was following the law of the time. In short, should Trump push to bring back torture, guess who’d be in line with her commander? Say what you will about Sen. John McCain (R-Ariz.)—and believe me, I’m right there with you—the man was tortured after being captured during the Vietnam War and has been the leading voice against torture, and he doesn’t believe that Haspel has reformed her beliefs. McCain is against confirming Haspel to run the CIA because he knows what Congress and the president know: Haspel is a thug disguised as a grandma, but she’s absolutely a thug.